I-93 traffic got off to a rough start on Thursday morning with an injury accident involving multiple vehicles. The accident happened around 5:00 am on Route 24 southbound in the left travel lane. This stretch of roadway is located in Andover, Massachusetts. Police in Andover rushed to the crash scene to check on the injured victims and to secure the area around the accident. 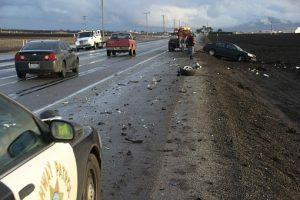 Traffic was blocked in the left travel lanes for some period of time as police were clearing the roadway of cars and debris. After about an hour, the road re-opened for motorists and traffic was allowed to pass through again. Although there were injuries in this accident, there is no further detail on the the severity or extent of the injuries to those involved. We will bring you more information about this crash if it later becomes available. Those traveling to and from work on in and around the Boston area are no doubt familiar with collisions that occur in cities and towns across our state. For those not involved, they are frustrating because they often cause long travel delays which results in inconvenience to all motorists. For those that are involved, the experience is obviously much worse, especially if injuries occur from the collision. Some injuries are more debilitating than others. Certain injuries may last only a short period of time and will respond well to medical treatment while others will linger for months and even years after the accident and may require a variety of treatment methods, including therapy all the way up to surgical intervention. In these types of cases, you do not want to settle too soon because your medical costs for the future will not be covered if you take a quick settlement offered by the insurance company and sign away your rights to receive future payments.